Throughout the second half of last year, I lost 30 pounds. I was on such a roll and a high that I vowed that this year I would hit my goal weight once and for all. I started walking every day (one goal) and eating pretty decently… until the evening. I got two GIANT bags of Boom Chicka Pop popcorn from Costco and I love popcorn… I like to eat a lot of it and it’s really one of the worse things you can eat when you’re trying to lose weight. You can eat a TON and feel like you haven’t eaten a thing. Did I mention it was on sale at Costco? It’s like buying the giant tub of popcorn (with refills) from the movies, for $4! It’s been on sale the last two times I went. Then the yummy animal crackers… oh, just a hint of sweetness, it satisfies my carb craving. Of course, all of this sounds a lot better with a glass of wine. It doesn’t help that I eat dinner around 6 or 7, but don’t go to sleep until 11… and if you’ve been eating every couple of hours all day, that 4 hour stretch before bed gets hard. So, of course, the logical thought is don’t have a drink, then don’t eat the junk and take my behind to sleep at a decent hour, right? So, I can do this. God does not want me to be unhealthy, and I shouldn’t mess up my progress. What has you feeling defeated? What is challenging you today? Almost every week, I go to church, and I get a LOT of the sermon. For a long while, I’ve been meaning to put it all into words on paper… not notes, but how I plan on applying it in my life. There will be some tidbits of the sermon, and sermon notes, in case you want to study further. 1 Sam. 16: God took an imperfect person, David, and anointed him. David, at the time, was a lyre player for the court, not in any high ranking position. Yet, in those times, before he became King of Israel, David took the opportunity to learn how the court worked for when he would take the lead, he knew what he was doing. I tried that popcorn and got to be honest didn’t really care for it, but then again not a huge popcorn fan here. So, kind of glad now I don’t like it, because if I did I wouldn’t be able to put it down either!! I used to snack after dinner… I stopped about 3 months ago, started eating healthier and keep myself busy so I don’t get tempted. I’ve lost weight since changing my lifestyle. Feel so much better for it! It wasn’t easy, but it is definitely worth it! Congratulations! I need to get there. I really think the key is getting up early because I’ll go to sleep around the time the kids go down. Can’t snack if I’m sleep. So nice connecting with you from the Blogging Mamas fb page. i love reading posts like these and giving myself daily reminders. Looking forward to more of your inspirational posts! You are so right! It can be a slippery slope! You’ve got this! Congratulations on your weight loss journey! It always seems like it’s a roller coaster, you do awesome and then go down hill a bit. But you got this I’m sure you can hit your goals in 2015. Can’t wait to read and follow more of your journey! Thanks. I have my ups and downs… and in this case, I’m hoping for more downs (weight losses) than gains this year. I really would like to be close to my goal weight by my birthday. I can do it, it’s completely reasonable. Costco is the worst for snacks, their portions sizes are crazy! Have you tried myfitnesspal? It really helped me lose weight, or just maintain weight as you keep track daily of what you are eating. I’m normally a good portioner. I will bring home a jumbo sized package and spend time breaking it down in single sized portions. I was just being lazy and my hips showed. I like MFP. The problem for me is I eat a bunch of different things so I have to spend a lot of time with single entry items and with the two little girls, I start and hardly finish one meal. I had almost completely kicked my sweet tooth before I got pregnant with my third. It’s been so hard to go back “pre-preg” eating. She completely turned my body upside down! Hi April: Great to see you on the healthy linky today! I think that you’ll be able to overcome your popcorn issues — the first step in figuring out a solution to a problem is to recognize the problem! Next step is to find something to snack on after supper that is filling but low calorie. Maybe veggies, or some kind of lean protein? Good luck, and hope to see you at this Linky next month!!! Thanks so much. I am really working on staying positive. Thank you. I know that we are all made for greatness, we just have to figure out how to get there! My boyfriend and I watch TV for a couple hours every night and we do tend to snack. We have to get better about that too! It sounds like we live a similar life. I have been feeling burnt out lately too, life on repeat like you said since I am a stay at home mom. I need to find some new things for the kids and I to do this summer so that every day is not the same. I love popcorn and find that if I buy a bag it is so easy to eat the whole thing. Instead, I make popcorn at home, the old fashion way. Much better portion control and it doesn’t make me feel bad for indulging. It is really hard to stay on track! I get those days myself where I want to indulge in some yummy sweets while watching tv. That’s a really good motivation. You have to realize the lifestyle that you have before you can change it to something that you want. That passage is very inspiring and it’s true as well. That 4 hour drought is what also gets me during the evening and I can totally relate to what’s happening with you. Chin up! I’ve seen a lot of inspiring blog posts already and it definitely makes my day end right. Lossing weight is a very hard word, you need to take a dedication to do it. Congrats and you did it! 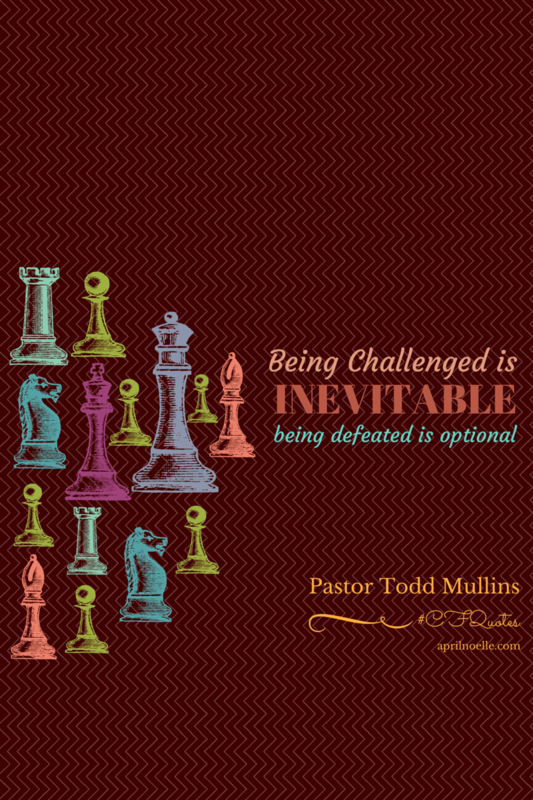 I agree that being defeated is a choice, we can go on to our life even if we fail- because we have a choice! Congrats on your journey, you are such an inspiration! Indeed being defeated is a choice we make and I chose victory everytime. Because nothing is impossible for even before that word in my book it means Im Possible 🙂 So challenges do come to make me a better version of myself! Awesome share April! Me too, I don’t want to be defeated. All of our problems and struggles must be taken one at a time so we can defeat each and we should never give up on life! Life is so beautiful! Sounds like you need a break from the daily routine. Sounds like me — was getting quite tired of the same day-to-day. A weekend getaway was great, but again – back to the daily grind! I don’t know if anything is really challenging me today. I’m actually doing pretty well, which I’m amazed at. Usually I’m having a challenge of getting things done, but for some reason today is been a great day! Congrats on your weight loss journey. Sometimes I can be difficult! I like that popcorn! I can’t eat after a certain time, because I get really bad heartburn at night and it keeps me up all night.